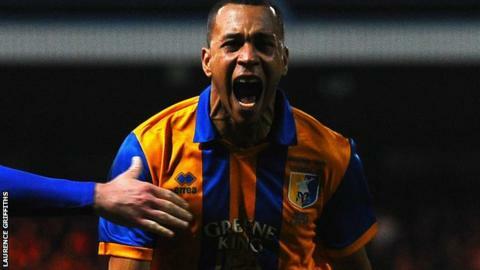 Matt Green helped himself to a hat-trick as Mansfield hammered Barrow at Field Mill for the second year running. Lee Stevenson found the top corner to give the Stags the lead before Danny Rowe levelled things from the penalty spot after being fouled by Lee Beevers. Green's penalty restored Mansfield's lead before Colin Daniel, Green and Adam Murray made it 5-1 at the break. Green added another penalty, Stevenson struck his second and Anthony Howell's header completed the rout. The victory equals Mansfield's club record-winning margin, following last season's 7-0 victory over the same opponents. However, they remained just outside the play-off places, but only three points behind Forest Green and Kidderminster. The defeat left Barrow 22nd in the table and with a goal difference of -26, the worst in the division. "Without the ball, I thought we were a different level today - the hunger to go and get the ball back against a side who've had some good results of late, when we're in that mood we're not bad. "We're not getting carried away, it's just one result and we've got another 18 to go, but there's a good feeling in the camp at the minute. "I'm not going to beat around the bush, to win any football match by that scoreline is immense."